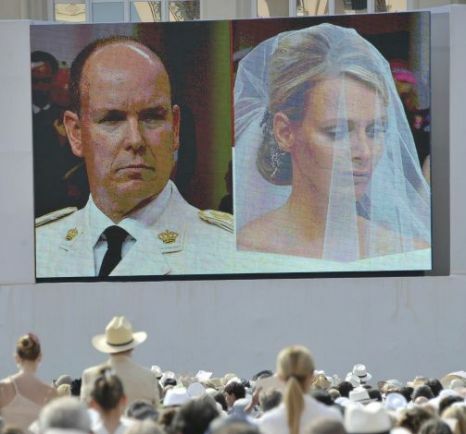 I’ll confess something…I watched the Royal Wedding of Prince Albert and Princess Charlene twice yesterday. First when it aired and then again later in the day. I never should have, as once was really enough. I wanted to see if I was ‘reading too much into it, which is why I went back for more. My thought was to view and not compare it to the wedding of Prince William and Catherine, but the Royal Wedding of Prince Albert and Charlene was just so painful. I know some brides cry…but I was in tears and heartbroken for her. If you take a look at the pictures of their civil marriage, were there signs in her wedding day outfit? It was a powder-blue corset, chiffon pleated palazzo pants and a powder blue jacket decorated with tiny silver and pearl buttons, which she designed with Karl Lagerfeld. Her hair was a low bun. It was relaxed and yet some have speculated that the ‘blue’ was code to how she was actually feeling. Were his eyes open a sign of his ‘disconnection’ to what was to be a romantic moment? Her facial express at the actual wedding ceremony was a combination of panic and sadness. Their body language was so reserved, one might think this was an arranged marriage and their first meeting. They barely looked at each other and Charlene mostly looked at the floor. Their kiss was so extremely painful to watch…I actually had to look away. I didn’t expect deep-throat passion…but at least ‘I like you.’ The kisses (William and Catherine and Albert and Charlene) were SO DIFFERENT. The more I watched, the more I wondered if this was for show. If she/they got caught up in the cost (estimated $65million) and people flying from all over and how ‘bad’ it might look to call it off with three days notice. When her veil was caught, he barely stopped as she waited for help to untangle it. He rolled his eyes and seemed bothered as they fixed the train of her gown. He spent lots of time waving to the crowd while she, had to be reminded at times. Could Princess Charlene’s emotional breaking point been reached when the reality that she is truly married to someone who possibly cheated on her within the last nine-months? Is it because ‘an arrangement’ was reached between them,’ as reported by Le Journal du Dimanche making this not a ‘marriage or fairytale’ come true? Did she just realize that this marriage just wasn’t what she wanted? Sources said the Monaco palace had hoped the glitzy wedding – attended by a host of celebrities and European royalty – would ‘overshadow’ new claims about secret children fathered by Albert. Even as they jet off to South Africa for a honeymoon, DNA testing is being done to see if he is indeed a father…again. What would you do? If you found out that the person you were about to marry, cheated on you and there is a possibility of a child would you stay or go? Would a price be attached and if so, how much? Of course we don’t know what the real story is…she very well could have just be overwhelmed at becoming a real life Princess. What can a bride learn from the Royal Weddings? 1 – You can love and be loved by your ‘prince’/’princess’. 2 – Holding hands, touching, are required daily and absolutely necessary. 3 – Weddings are emotional times and if your partner is suddenly in tears, do something! This is the person you’re just swearing to be with forever, so lean into them, tell them a joke, a kiss on the cheek – something – anything. Showing compassion is a requirement and will make your action endearing to all that witness it. 4 – If you have that sinking feeling, no matter how much it costs…put it on hold, or call it off. Trust me, it’s better before the ‘I do’. No matter what, both Princesses were beautiful…hopefully they will have their happily ever after. 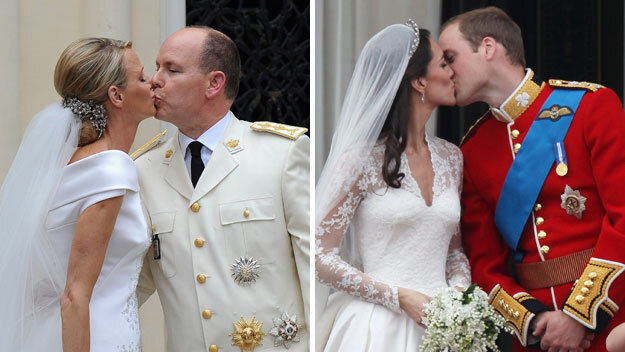 Here’s wishing Prince Albert and Princess Charlene all the best. With an expected sea of camera flashes, Catherine, Duchess of Cambridge made her first official bow as a working princess Thursday night, joining her husband, Prince William, at a glamorous London fundraiser. Kate, 29, stepped out of her blue Jaguar in a floor-length blush organza Jenny Packham gown (Jenny does both ready-to-wear and bridal) at the 10th annual Absolute Return for Kids (ARK) gala dinner. As William placed a guiding hand on his wife’s back, she giggled a little as she stopped on the purple-carpeted steps for photographs. I have to say I LOVE the fact that he is a gentleman and they are not scared to ‘touch’ each other in public. They actually seem to be a couple – a real couple in love. They make a striking couple and I’m sure as they move along in their life together, there will be more show-stopping photo opportunities. Hey, I give credit where credit is due…Thank You People Magazine…. 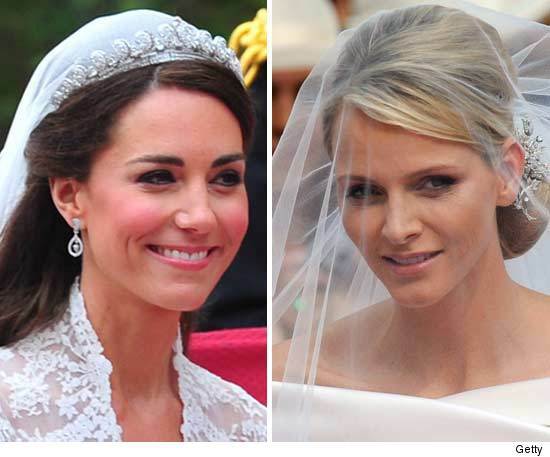 Weddings are always family affairs, and Kate Middleton‘s is no different. With just over a week to go before she marries Prince William, Kate, 29, and her family have been granted a traditional coat of arms, which was unveiled Tuesday. Three acorns, symbolizing the Middleton children, and a flash of gold to represent Kate’s mother, Carole, are at the heart of the design. But there’s more meaning to the choice of imagery than meets the eye. In addition to signifying the princess-to-be and her siblings Pippa, 27, and James, 24, the acorns also hark back to the oak trees that grow near Kate’s home in Bucklebury, Berkshire. Puns are also traditional in heraldry design, so the designers at the College of Arms used gold for the thick band in the middle to represent Carole’s maiden name: Goldsmith. The two white chevrons on each side of the band are meant to denote hills and mountains and represent “outdoor pursuits that the family enjoy together,” according to a statement released Tuesday. The blue ribbon above the shield-like design signifies an unmarried daughter. This coat of arms, which will stay with the Middletons, will be merged with Prince William’s when the couple is married, and a new design will be constructed for the Princess (a process that takes several months). The Middleton family “took enormous interest in this design and, while its purpose is to provide a traditional heraldic identity for Catherine as she marries into the Royal Family, the intent was to represent the whole family together, their home and aspects of what they enjoy,” says Thomas Woodcock, Garter King of Arms at the College of Arms. Are you in Catherine Middleton overload? I know it’s everywhere. My contacts in London, think we American’s are crazy to be all caught up in it. Hey, it’s not every day a couple who seemingly are in love get married…OH YEA…one just ‘happens to be a real ‘Prince’ charming. 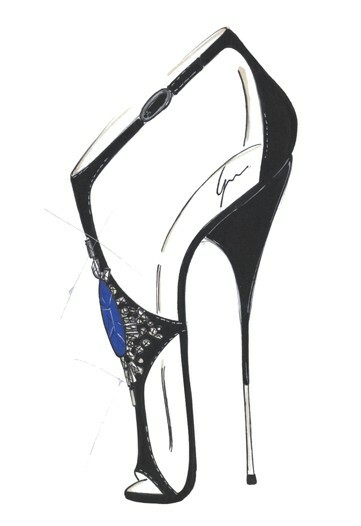 Well, I just happened to be reading WWD and saw these lovely “If I could design for Catherine, I’d…” by some of the shoe-masters of the universe. What do you think? 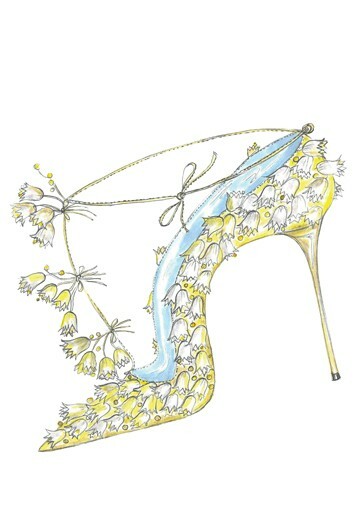 I mean, like (some) fashion, these may be pretty to look at by so not practical to wear. 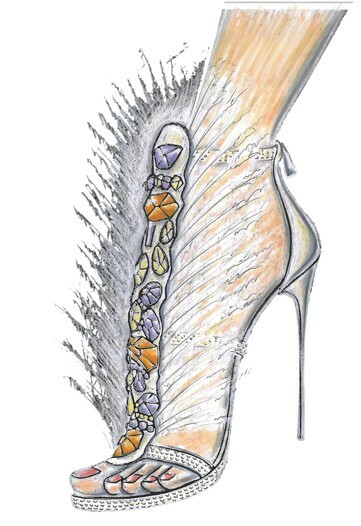 Her design: An antique Welsh lace pump with Scottish seed pearls and pearl-inspired heel “I wanted to create something special with an intrinsic emotional value; something old and at the same time mirroring Kate’s fresh modernity. … I have aimed for a balance between history and femininity fitting the occasion; a kind of luxury recycling.” Do you have a favorite?